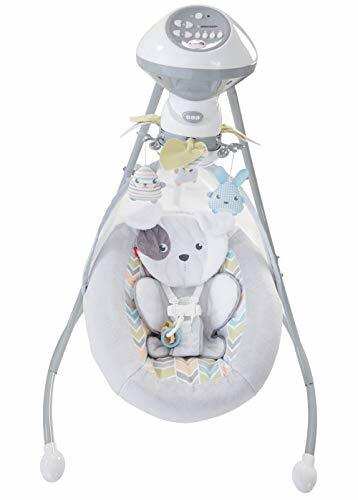 #10 Best baby swings under $100 in 2019. Don’t let the cheap price tag fool you because here are the best baby swings for parents-to-be to consider. Babies are a wonderful blessing and bring joy to the whole family. However, as a mother, you have to put the baby down at some point so that you rest a little, take a quick shower, or do something else that is needed to be done around the house. And this is where a baby swing comes in! These baby swings are a real lifesaver for the parent. They can help you out when it comes to calming your little ones whenever they are in a terrible mood or even crying. The most important thing is that these swings and rockers contain numerous features including toys, soothing vibrations, classic melodies and nature sounds, and rocking options to help you as a new mom to put your baby to sleep without having to put extra effort. We understand it is quite challenging choosing the right baby swing due to so many options available online. 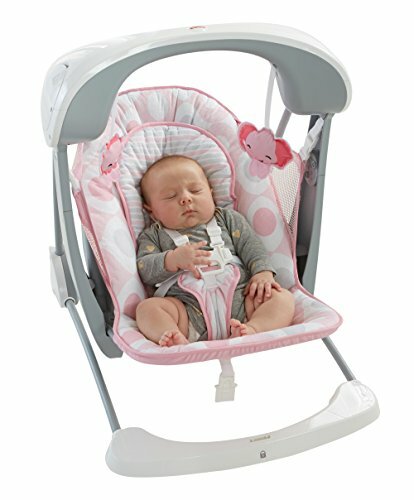 But here are some few things you need to keep in mind when looking for the best baby swing: price, variable speed, and controls, recline positions, seat padding and removable cover/seat, music and nature sounds, built-in toys, power option (battery-powered or electricity-powered), design and quality, mobility, and size. With these factors in mind, it is quite easy making an informed decision depending on what kind of baby swing or rocker you are looking for. Let’s get started, shall we? If you are looking for the best baby swing, then you have come to the right place. In this article, we have done extensive research to ensure that you find the best baby swing that suits your needs and budget. Below we have compiled a list of detailed reviews for each one of these best baby swings under 100 dollars to help you choose better. Let’s find out which baby swing is the best for your child. The fabric is soft and easy to clean. 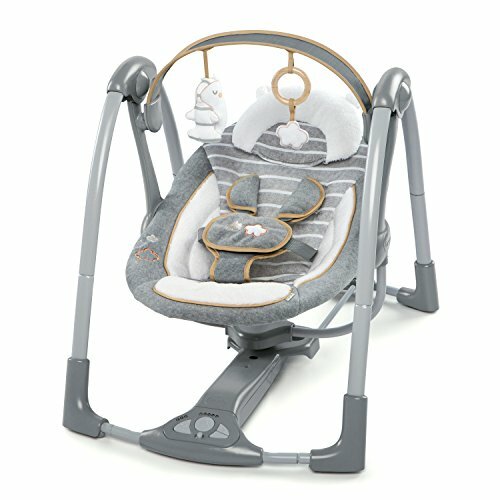 The Graco Simple Sway Baby Swing is one of the best baby swings available in the market today. This baby swing provides so many impressive features to help you comfort, relax, and soothe your little one. It comes included with two different vibration intensities which are perfect for calming your child. There are six swing speeds that match your kid’s swinging mood. More than that, this unit operate quietly, so you do not have to worry about your baby crying out loud in the next minute after falling asleep. You can either operate it by plugging it into an electricity socket or batteries, which is very convenient. Some people suggest that batteries are better since they can save the electricity bill. The unit has a simple design, so you don’t have to worry about it taking up too much space whenever you place it. It is incredibly easy to move it around the house also. Most importantly, this baby swing is capable of accommodating a baby weighing from 5.5 pounds to 30 pounds. When purchasing this unit, you should make sure that your little one doesn’t beat the recommended weight limit. When it comes to the safety of your child, the Graco Simple Sway Baby Swing features a 5-point harness system that keeps your child secure at all times. Bottom line: The Graco Simple Sway Baby Swing comes with everything you need to soothe, relax, and comfort your little one. At the time of writing, this Graco Swing was featured as the #1 best-selling baby swing on Amazon. As you can see, it is a great value for your money. Offers two different swinging modes. Can be operated by using the AC adapter or batteries. The frames fold easily for convenient storage. Some parents claim that the swing’s motor makes a lot of noise. 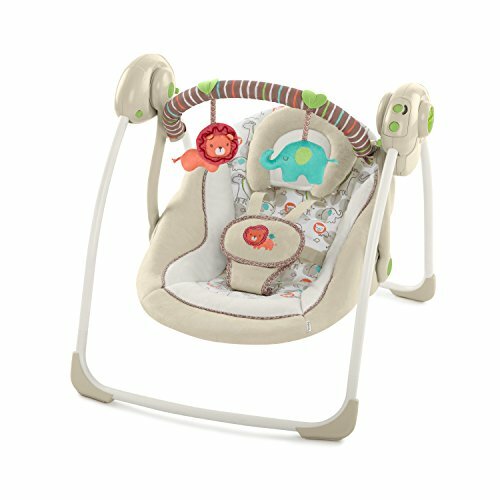 The Fisher-Price Sweet Snugapuppy Dreams Cradle ‘n’ Swing is an advanced baby swing which every parent should consider. It comes equipped with two swing directions: side-to-side and head-to-toe. 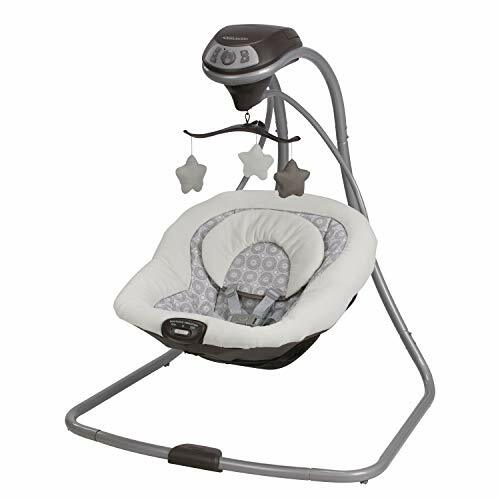 Fisher-Price boasts that this product features Smart-Swing technology that automatically senses your kid’s weight and maintains that speed as your baby grows. Furthermore, this product provides six different swinging speeds, allowing you to find the perfect rhythm for soothing your baby. More than that, it is equipped with 16 different songs and three nature sounds to select from. 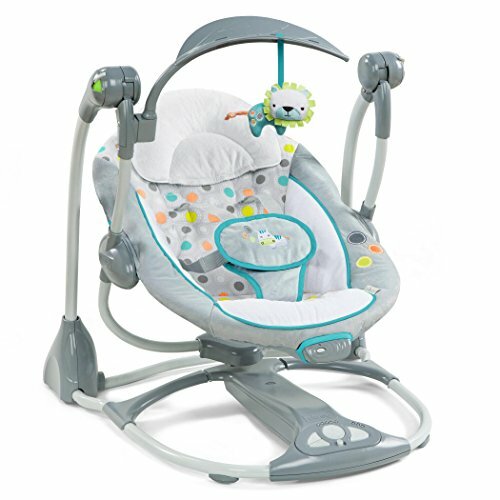 Fisher-Price Sweet Snugapuppy Dreams Cradle ‘n’ Swing has a maximum weight capacity of 30 pounds. Additionally, the 5-point harness system helps keep your little from leaning over or sitting up. The controls for Fisher-Price Sweet Snugapuppy Dreams Cradle ‘n’ Swing is easily accessible, located at the top of the baby swing. From here, you can select your favorite music and control its volume, turn on/off the motorized mobile, and also adjust the swing speed. Bottom line: You will really love this fascinating baby swing. It comes with two different swing modes, two comfy reclining positions, six swing speeds, and 16 soothing songs and nature sounds. With so many features, no wonder Fisher-Price Sweet Snugapuppy Dreams Cradle ‘n’ Swing is one of the most popular baby swings on the market. The incline is perfect for baby digestion. Lightweight and folds easily for storage. Integrated hands-free rocking is incredible. You have to transfer your little one to the crib once they fall asleep. Doesn’t have any vibration settings. This is another excellent quality product from Fisher-Price that you should consider. This baby swing features an elegant and portable design. Besides, it does not lag behind when it comes to quality, durability, and long lasting service life. The materials used to build this product are excellent quality, and the fabric feels quite superior to other brands. This product comes with two rocking modes which you can adjust on how gentle or how fast you want to rock your baby. More than that, you can choose between the 30-minutes mode perfect for short nap times and 6-hours mode ideal for night time sleep. The Fisher-Price Auto Rock ‘n’ Play Sleeper also comes with a sleeper and playtime seat all in one small package. Because it can be powered by an AC plug, you do not have to keep charging the batteries every not and then just to run the product. The Fisher-Price Auto Rock ‘n’ Play Sleeper features 12 musical tunes and three acoustic effects, which you can activate with just a press of a button. It comes included with a detachable plastic clacker toy to keep your child busy and breathable mesh sides which ensure your little one stays comfortable and cool. Bottom line: The is an excellent choice for those looking for a good sleeper and rocker all in one. This product is portable, lightweight, and super comfortable. In addition, it has 12 soothing songs and three acoustic sound effects and a detachable toy. Very portable and lightweight to carry around. Compact design needs less space and easy to store. Swing and rocker all in one small package. The musical tunes are a bit loud. 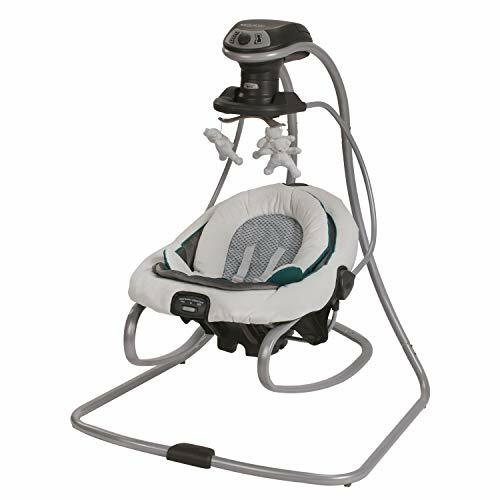 The Graco Duetsoothe Swing + Rocker is a multi-functional baby swing which comes with a rocker and an infant swing combined. The infant swing keeps the baby jovial and playful, while the rocker soothes her and makes her fall asleep. It has three different seating positions – you can choose whether to swing side-to-side or front-to-back. It has a soothing vibration feature with two speeds to keep your little one quiet and happy. With the two-position adjustable recline which elevates your little one and avoid her head from falling sideways or forward. It can be operated by either using batteries or plugging it in a power outlet. This way, you can choose which you see is more convenient for you. In addition, it comes with a useful carrying handle which makes it easy carrying it from one place to another. 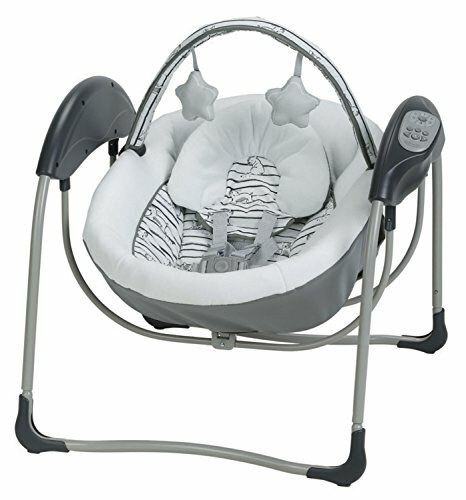 The Graco Duetsoothe Swing + Rocker also feature an attached mobile and three plush toys to keep your baby entertained. More than that, this particular product has a musical option that consists of five different nature sounds and ten songs to calm the baby. Bottom line: The Graco Duetsoothe Swing + Rocker is one of the most affordable and best-quality baby swings if you are on a tight budget. The swing and rocker combo ensures that you get the best product without having to break the bank. The motor operates very quietly. The slim and foldable design makes it easy to store and carry around. The head support is not adjustable. The Ingenuity ConvertMe Swing 2-Seat Portable Swing is a two-mode baby swing which serves as a swing and also as a vibrating seat with a press of a button. It features a slim-foldable design which easily folds flat when travelling or when you want to store it to save some space in the room. Most importantly, the Ingenuity ConvertMe Swing 2-Seat Portable Swing is powered by the Hybrid drive technology which minimizes the battery consumption. This means that the battery life of this product can last up to three times longer compared to other baby swings. When it comes to musical, the baby swing comes with eight harmonious melodies and three different nature sounds to soothe your baby and relax. It also features five swinging speeds and soothing vibrations for additional comfort. Unlike other baby swings, this product doesn’t have the AC plug option, so you will have to depend on the battery for all your needs. Some consumers claim that the Ingenuity ConvertMe Swing 2-Seat Portable Swing doesn’t include enough head support for the newborns. The best thing about this product is that it consists of a five-harness system and non-slippery seats, which ensures the safety of your child at all times. Bottom line: If you are looking for the best baby swing for the money, then the Ingenuity ConvertMe Swing 2-Seat Portable Swing is the best option to consider. With all those impressive this baby swing offers, it is worth every penny. Folds up very quickly for convenient storage and travel. Comes with six different speed settings. It is included with a timer and auto shut-off function. The headrest can be removed as the child grows. Lacks any external power function. The Ingenuity Cozy Kingdom Portable Swing is one of the best baby swings under 100 dollars on the market. This product comes loaded with many terrific features including six different swinging moods which you could adjust to suit your baby’s mood. More than that, the seat is nicely padded, and the included head support is removable that makes it perfect for littlest babies. In addition, features a five-point harness system which not only ensures your baby is calm and comfy, but it also makes sure your little one is secure and safe. Above the child’s head, there is a pivot bar with two plush animal toys which keeps her entertained. The Ingenuity Cozy Kingdom Portable Swing comes loaded with 6-different musical melodies and nature sounds which helps soothe the baby. There is a volume control feature that allows you to choose the perfect audibility for the child. This swing has a timer and an auto shut-off feature, which automatically turns off the unit after 30, 45, or 60 minutes. Bottom line: The Ingenuity Cozy Kingdom Portable Swing is a great option for every parent. It comes loaded with tons of useful features which will keep your baby comfortable and safe. Also, it has a compact and portable design – all those features for a pocket-friendly price. The motor operates very silently. The fabric is soft and machine washable. Folds up easily for compact storage and travel. Does not have an AC plug-in option. Ingenuity Boutique Collection Swing ‘n’ Go Portable Swing is another one of the best baby swings from the Ingenuity. This product can be folded flat, hence making it easy to transport and store. When your little one is not using it, you can always fold the baby swing flat in a few seconds. Additionally, the Ingenuity Boutique Collection Swing ‘n’ Go Portable Swing is powered by the Hybrid drive technology which minimizes the battery consumption. This means that the battery life of this product can last up to three times longer compared to other baby swings. You will surely save some money on the batteries. The extra plush seat and removable head support provide your baby with a comfortable and cool place to rest. The motor operates very silently – all you hear is the swing’s soothing musical tones and nature sounds. The removable toy bar features two plush toys which keep the baby entertained and relaxed. This baby swing comes loaded with five-different swinging speeds, eight musical melodies, and three nature sounds for soothing the baby. Additionally, the TrueSpeed technology automatically senses the baby’s weight and keeps the speed consistent, even as the child gets bigger. For extra safety and security, it features 5-point harness system and non-slip feet. Bottom line: The Ingenuity Boutique Collection Swing ‘n’ Go Portable Swing is a wonderful classic baby swing with numerous functions. If you are looking for something more versatile, then this baby swing is the best buy for you. The motor operates super quietly. The Bright Starts Zig Zag Zebra Portable Swing is a battery-operated baby swing with a five-point harness system which ensures your baby safety. This swing folds flat for convenient storage and portability. The pivoting mobile comes included with two plush toys to keep your baby company. Also, you can easily remove the pivoting mobile when you need to take your little in and out of the seat. This swing comes with a deep cradling with two reclining positions, hence offering a comfortable environment for the child. The TrueSpeed technology keeps the swing speed consistent despite the baby’s weight as she grows. The Bright Starts Zig Zag Zebra Portable Swing also includes calming music and different nature sounds. When it comes to cleaning the cover, it is incredibly easy – you simply have to throw it in the washing machine. 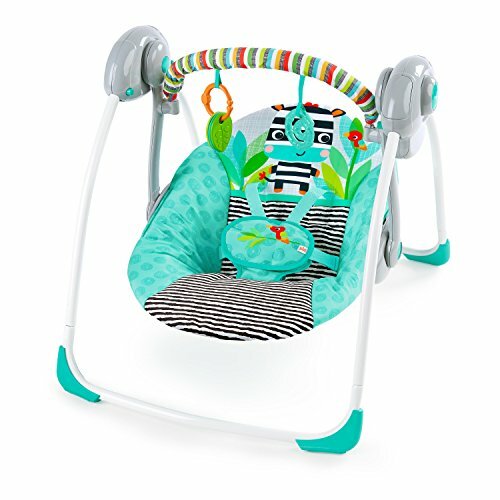 Bottom line: The Bright Starts Zig Zag Zebra Portable Swing is a great option if you are looking for the best baby swing with a budget-friendly price tag. The head support can be removed. Can be operated by both batter and AC plug-in. The soothing vibration stops as soon as you hold the swing. This innovative gliding swing is uniquely designed for babies and toddlers. The boasts of having ten classical melodies, and five nature sounds to entertain the baby. In addition to its fascinating gliding functionality, this product has a spacious and comfortable swing seat where your child can sleep comfortably. It also features head support which is removable whenever necessary. This swing is lightweight and portable, which makes it pretty easy to use anywhere in the house and carry around to the park. More than that, this product comes with six different swinging speeds, allowing you to choose the best speed for your child to soothe and relax. The 5-point harness system ensures the safety of your child while swinging. This means you can carry out other tasks without worrying about the safety of your baby. The removable toy bar makes it very convenient for accessing your baby. Bottom line: The is a great option if you are looking for a gliding swing. It comes loaded with amazing features to help soothe and amuse your baby, including six gliding speeds, ten classical melodies and five nature sounds, three recline positions, and a comfortable seat. Real value for the money. Very lightweight and portable to carry around. The swing is battery operated. This product features SmartSwing technology that automatically senses your kid’s weight and maintains that speed as your baby grows. At first glance, this product is very exquisite and luxurious. Fisher-Price Deluxe Take Along Swing & Seat comes with a spacious and comfortable seat that swings to keep your child relaxed and soothed. This swing also stays stationary which is perfect for newborn babies who might get uneasy with the motion. Furthermore, it provides six different swinging speeds, allowing you to find the perfect rhythm for soothing your baby and soothing vibrations for additional comfort. More than that, it comes loaded with 12-different musical melodies and nature sounds which helps soothe the baby. Above the child’s head, there is a pivot bar with two plush animal toys which keeps her entertained. Unlike other baby swings, this product doesn’t have the AC plug option, so you will have to depend on the battery for all your needs. 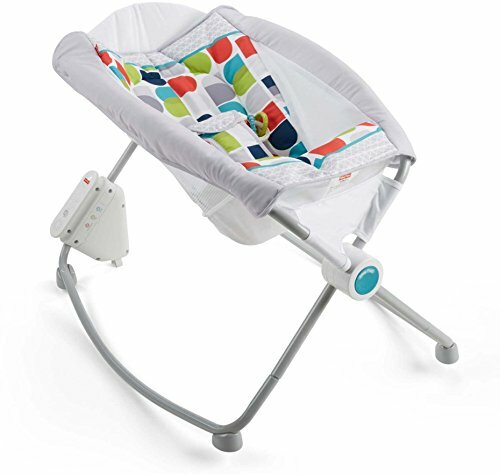 Bottom line: The Fisher-Price Deluxe Take Along Swing & Seat is a must-have swing for your baby. It features a pocket-friendly budget, occupies a small space, it is very portable, can be folded for storage, and the safety of your baby is maintained. We have come to an end of our comprehensive of top 10 best baby swings under 100 dollars. As you can see, there are so many baby swings and rocker on the market today. We reviewed those products which have been rated the best baby swings amongst mother (or parents in general) who have used and tested the swings themselves. When it comes to products uniquely designed for children and infants, safety always remains the top priority when making any purchase. All of these baby swings features 5-point harness system and non-slip feet to ensure the safety and security of your child whenever you are not around. Before we call it a day, our winner for the best baby swings under $100 is Fisher-Price Sweet Snugapuppy Dreams Cradle ‘n’ Swing. It is one of the best baby swings available especially if you have a child that is tough to soothe. This product can soothe in two directions: side-to-side and front-to-back. Overall, it is a great value for your money. Last updated on January 30, 2019 .